Photo taken in 1888 on a team trip to Tasmania. Long time servant of the Carlton Football Club. 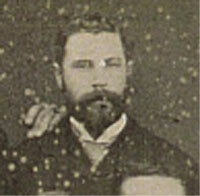 He had a brief playing career and played for Carlton in 1881. W. C. Donaldson - 1896 M.C.G. Page last modified on Wednesday 30 of August, 2017 18:46:31 AEST by blueycarlton. 1982 - Barry Armstrong retires.